When I asked for recommendations for Mohanlal films some time ago, Vanaprastham was mentioned a number of times, and now I understand why so many people suggested it. 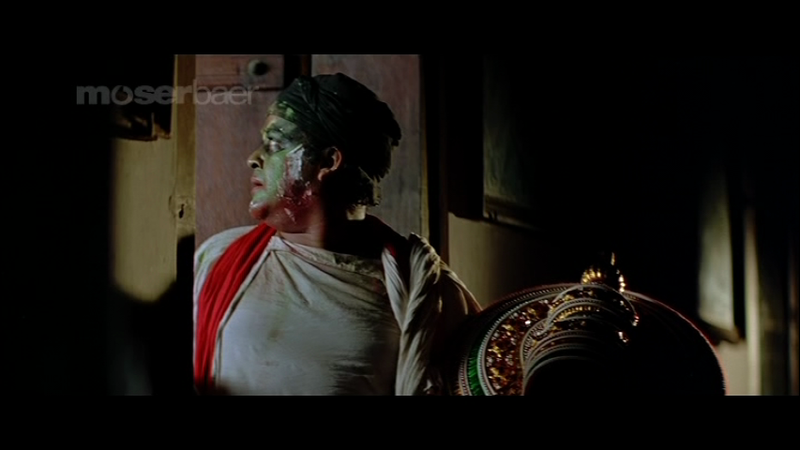 I think this is the best performance by Mohanlal I’ve seen, and it has whetted my appetite for more of his films. 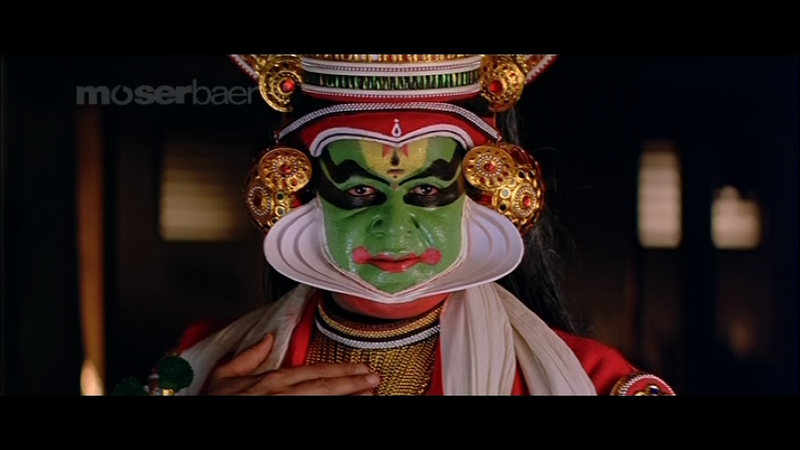 Although Vanaprastham is a simple story about a Kathakali performer set in the middle of the last century, Mohanlal’s performance brings depth and intensity to the role and he is mesmerising. 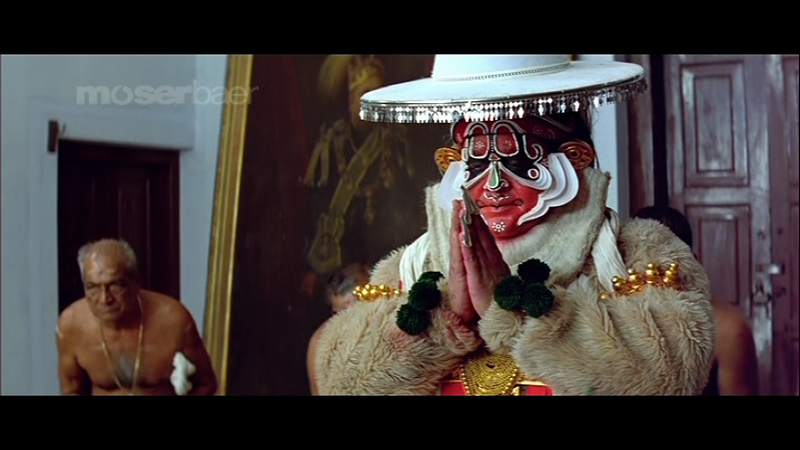 Presumably due to the fifties era, there is plenty of repressed emotion and the reliance of the Kathakali performer on facial movement transfers directly as Kunhikuttan (Mohanlal) doesn’t say much but rather lets his expressions and in particular his eyes, speak for him. It’s a sad film, but it’s beautifully shot with gorgeous costumes and, as ever in Malayalam cinema, stunning cinematography. Like the previous Shaji Karun directed film I watched (Kutty Srank), there is much about the story that is untold and left to the imagination, although the drama does proceed more linearly here. 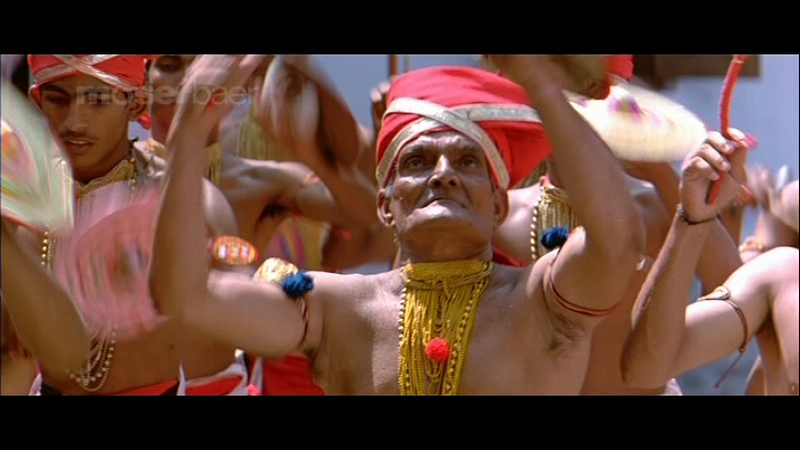 Just in case anyone needs any more motivation to watch, Vanaprastham (aka The Last dance or Pilgrimage) screened in the Un Certain Regard section of the Cannes film festival when it was released in 1999, and won accolades at other international festivals as well as a number of National awards. Kunhikuttan is introduced by a series of brief images interspersed between the opening credits which suggest that he is a lazy man who drinks, is looked after by his mother, disliked by his wife and adored by his daughter who is desperately trying to get his attention. And while that does sum him up on a purely superficial level, there is much more to Kunhikuttan. A flashback shows his acceptance into dance classes as a child in the thirties, and reveals that he has never had any contact with his nobleman father. This is a loss which he feels throughout his life and it appears to at least partly explain some of his reactions to subsequent events. 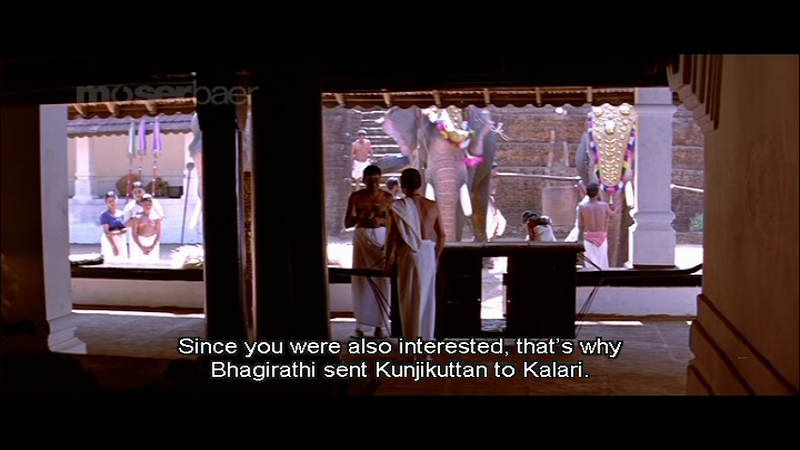 There is a lovely connection here between the scenes of the dance school with Kunhikuttan as a child and then again as an adult, where the same background of the temple elephants being dressed in their finery is unchanged despite the changes in Kunhikuttan. I also love the young Kunhikuttan’s expressions as he dances, particularly compared to the more rigid faces of the other boys. Kunhikuttan has an unhappy arranged marriage and his wife Savithri (Kukku Parameswaran) seems to despise him and his performance career. Her antipathy towards her husband is one of the ’things that are never explained’, and there didn’t appear to be any obvious reason behind her animosity. Kunhikuttan’s daughter on the other hand adores him, and she is the one bright spot in his life outside of his stage performances. At the start of the film, Kunhikuttan has just reached the point in his career where he is able to play male roles, and he takes on the part of Arjuna in a performance which is seen by the niece of the Diwan, Subhadra (Suhasini). Her character is at first only glimpsed as a hand at the window of the women’s viewing area, and this seems to be a foretelling that she is a private and somewhat hidden persona. Although one with excellent taste in jewellery. Subhadra is always alone and lives in a large house with only two elderly servants for company. She is mainly depicted as always writing, sometimes even during the performances, and she seems a rather pitiable character who is lost in her own dreams and fills her days with illusions. She falls in love with Kunhikuttan but it is immediately apparent that she is obsessed with Arjuna the character rather than Kunhikuttan the man. All her writing is put to good effect though as she writes a version of the Arjuna/ Subhadra story which she persuades Kunhikuttan to perform. Subhadra’s obsession is clear in the scene after the two have made love. 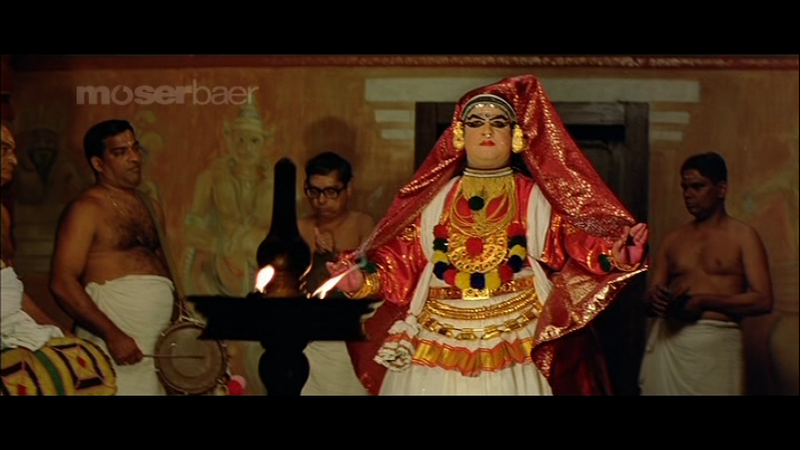 Subhadra seems to revel in the smears of make-up on her face and looks ecstatic, while Kunhikuttan sneaks out of the room, guiltily carrying his costume and immediately goes to bathe. Subhadra has no time for Kunhikuttan the man and when she has his child she allows him to meet his son briefly and then explains that she will have nothing more to do with him. Kunhikuttan yearns to be with his son, particularly since he never knew his own father, but he is denied the opportunity to be a part of his son’s life. This is just one more pain for Kunhikuttan to deal with, along with his continual poverty, his unhappy home life and the looming illness of his friend. Mohanlal expresses his emotions perfectly, showing restraint and sincerity throughout. His easy camaraderie with his fellow performers, his obsession with his son and the deteriorating relationship with his wife are all brought clearly to life. Suhasini is also excellent as Subhadra and is particularly good in her scenes with Mohanlal when she is obsessing about Arjuna. At times the film does get a little confusing, and the occasionally obtuse nature of the subtitles in my DVD copy didn’t help. Kunhikuttan’s friend who is one of the singers is called Namboothiri, but I think that Kunhikuttan also uses this term (which I believe means Lord) to refer to his father. 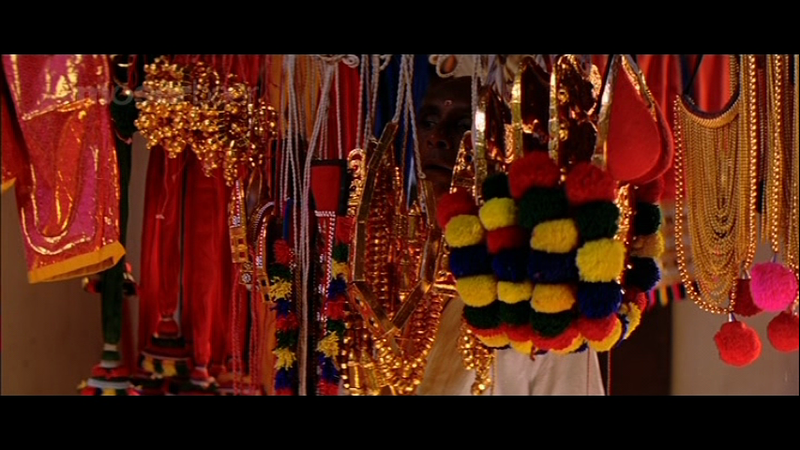 Kunhikuttan goes to Kasi to perform rituals which I thought were for his friend, but later seemed to be for his father. The ageing effect is also not terribly obvious, and it is only because Kunhikuttan’s daughter grows up that I was able to work out a significant amount of time had passed. 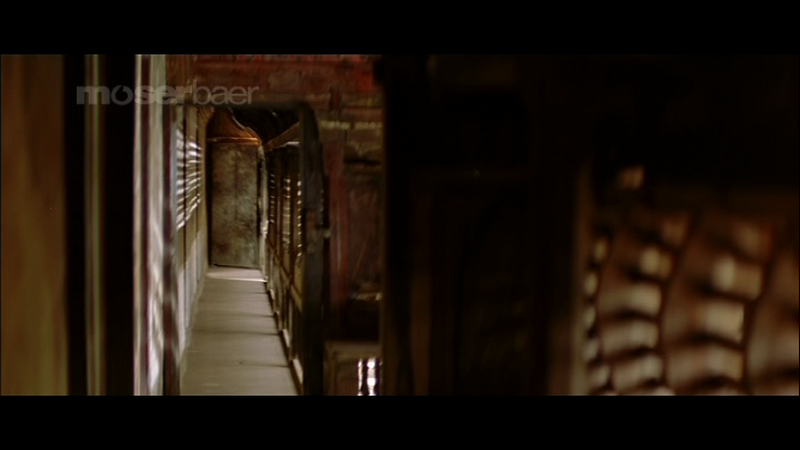 The cinematography by Santosh Sivan and Renato Berta is simply stunning. The natural world is cleverly contrasted with the artificial world of performing and every image is full of detail. The art-form of Kathakali is showcased with beautiful images of the performances as well as glimpses into backstage life. It’s a visual feast and at times I needed to rewind to fully grasp the action as I was distracted from reading the subtitles by the quality of the imagery. I was impressed by Mohanlal’s dancing, particularly since he isn’t a classically trained dancer and yet as far as I could tell, he held his own against the professional dancers in the cast. I found it surprising that the dancers were all living in poverty despite the apparent recognition of their skills and I wonder if this is still the case to-day. The costumes certainly all look expensive and they must go through truckloads of make up for each performance too! Vanaprastham is full of symbolism, from the title referring to the stage of life where spiritual concerns take over from the day-to-day responsibilities, to the parallels between the story of Arjuna and Kunhikuttan’s life and I’m sure that there are many more details I missed. The performances are excellent, the background music by Zakir Hussain blends with the traditional songs and the story which seems so simple initially has plenty of complexity and depth. It’s an absolute must watch and I thoroughly recommend it! A full 5 stars. This entry was posted in Mollywood and tagged Kukku Parameswaran, Malayalam, Mohanlal, Renato Berta, Santosh Sivan, Shaji N Karun, Suhasini, Suhasini Maniratnam, Vanaprastham, Zakir Hussain. Bookmark the permalink. 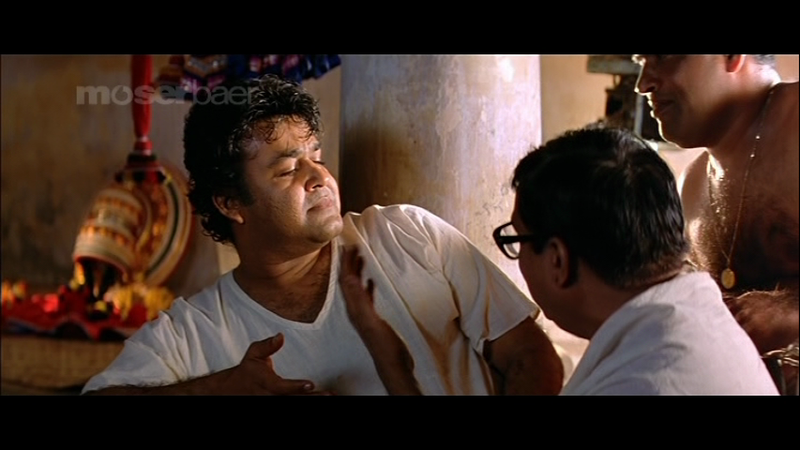 Mohanlal around 1997 and 1999 without his moustache is cute..
Iruvar is the other film I’d seen with Mohanlal, and I liked him in that too. I don’t think it’s the lack of a moustache though 😉 I’ll watch more of his films and see! I have more Mohanlal recommendations to watch, and they do seem to lean more towards his earlier films 🙂 However some of his older films are both difficult to find and even more difficult to find with subtitles! That’s a great suggestions and I have seen a few on Youtube. I guess this is as good as place as any to ask for help. 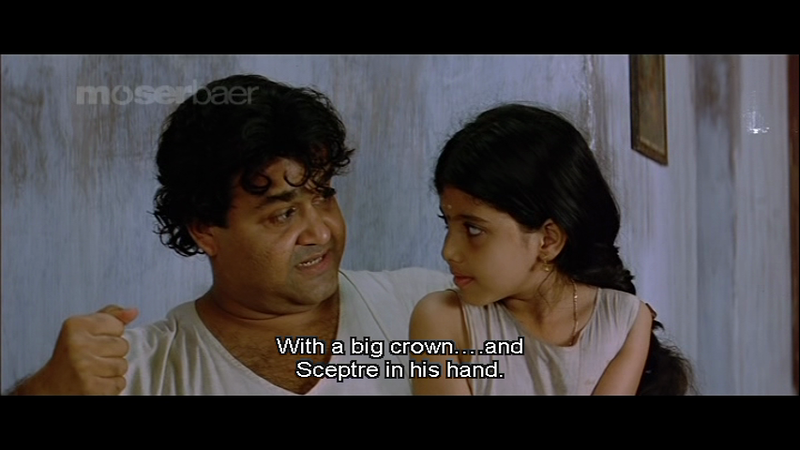 Long time ago, (definitely before 1993), I watched a Mohanlal movie on DD. It was a great love story between a Christian couple (or mixed-religion one) in a rural setting. 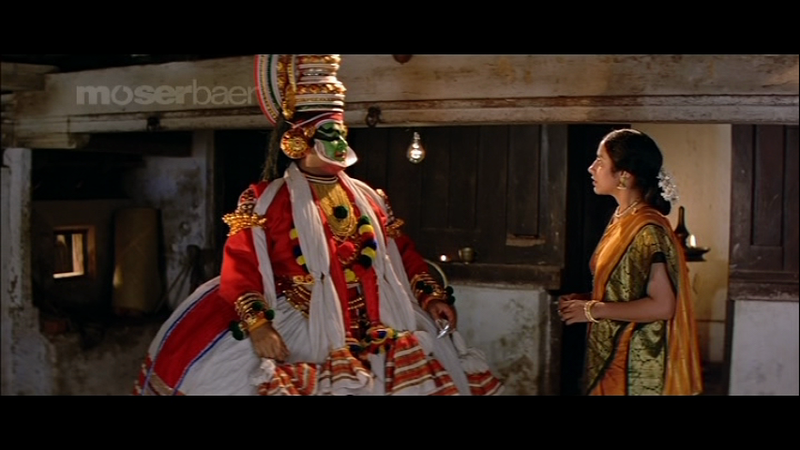 Being a non-malayaali, I didn’t quite got the correct name of the movie. Then wiki and google fail to point at the right one. Any recommendations of Mohanlal in a love story? He must have done quite a bit in 80s I guess, but anything famous enough to make it to Doordashan other-language movies list aired on Sunday afternoons? Thanks in advance for space and help. I have a slight preference to Mohanlal compared to Mammootty, although I would watch either of their movies any day. I didn’t even have to see it in full. Just saw the picket-fence that’s it! I know this is the one! Then I saw the clip and it is the one I was looking for. I really like the way Mohanlal smiles to himself walking along fences thinking about his interaction with heroine. These, of course, are only a handful of movies. 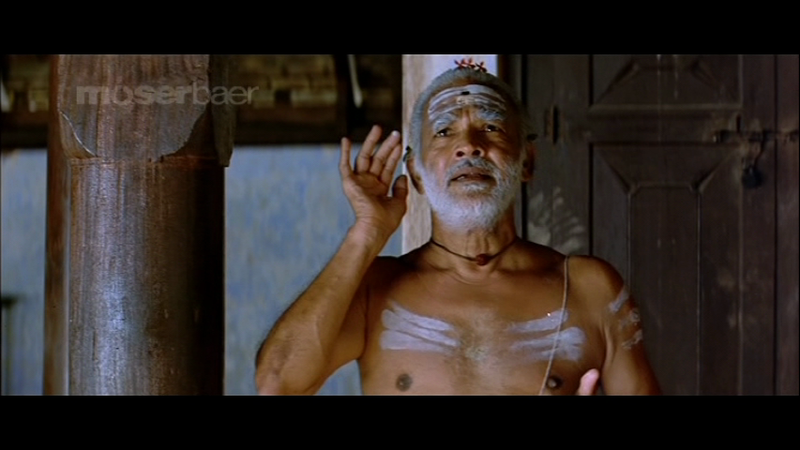 But they summarize the acting range of Mohanlal. The difficult part is finding the films on DVD, and then finding them with English subtitles! 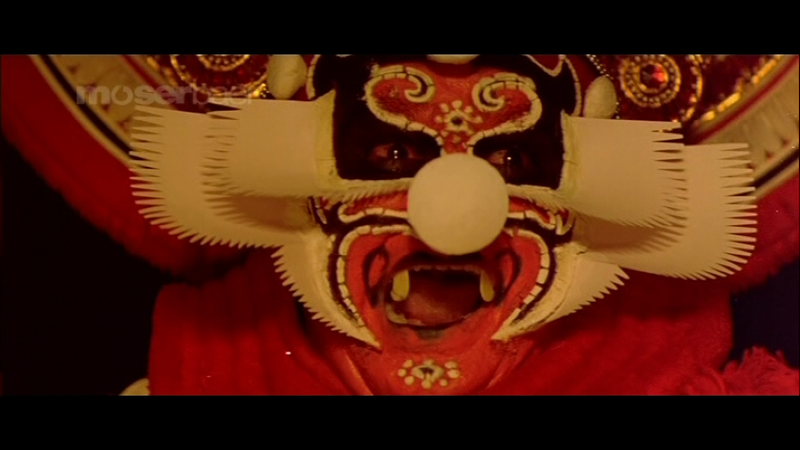 I am slowly discovering what an amazing actor Mohanlal can be so I will definitely try and track these down. I would certainly recommend movies directed by PADMARAJAN which stars MOHANLAL. I don’t think there has been any other films which has so much of emotions. Their pair made all time great movies. Some of those are already on the list, but a few more to add – excellent!